Party poppers, top hats, confetti and champagne—the glamour and joy of New Year’s celebrations are a thrill. Some pay the price on the first of January, however. When all you want is to share a warming, home-cooked meal with your loved ones, you wake up to a splitting headache… How can you cure that hangover? Good news! You can still enjoy a scrumptious brunch and impress New Year’s guests with minimal effort. 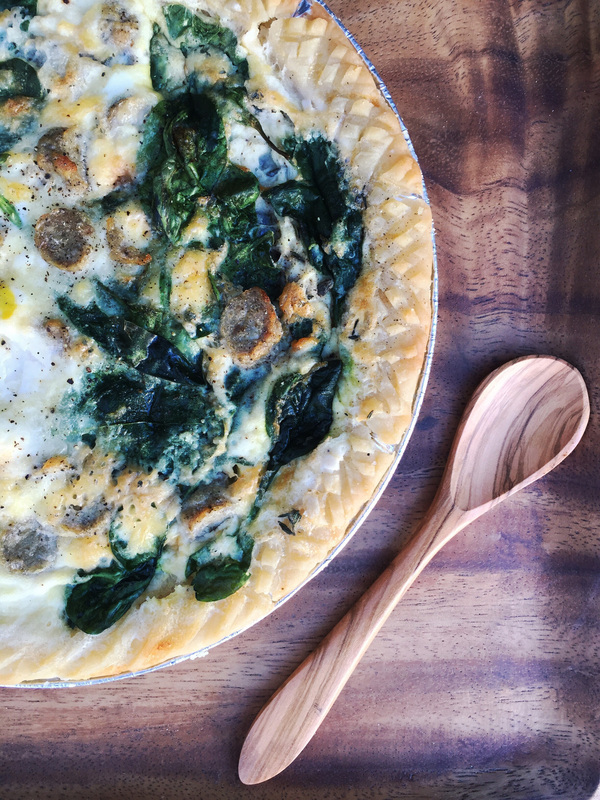 Pre-prepare this Hangover Breakfast Pie recipe, refrigerate up to two days, and bake! It is hangover-friendly and ready in minutes. Serve your breakfast pie on gorgeous, Hawaiian-made Acaciaware® wood products for a simply elegant presentation. Harvested and hand-crafted from non-endangered acacia wood, this fine set of specialty items creates an extraordinary New Year’s brunch without the hassle. After all, breakfast is the most important meal of the day and this pie is the ultimate cure. It warms the heart and strengthens the body. Rich nutrients from the spinach, carbohydrates and vitamin C from the potatoes, as well as protein from the eggs help rejuvenate the body to start the New Year right. For gluten-free guests, use a potato-based or a gluten-free pie crust. Enjoy this wholesome recipe for years to come. May you have a blessed (and hangover-free) New Year! Line a cookie sheet with parchment paper. Toss onion, thyme, sage and potatoes with olive oil, salt and pepper on the sheet. Roast in the oven at 400°F for 18 minutes. Unwrap and thaw the piecrust for 10 minutes. Pop in the oven with the vegetables for 3 minutes to soften. Using a fork, crimp the piecrust edge diagonally for the desired shape. Wave-like strokes create the most impressive look. Hint: place the piecrust on another baking sheet for easier removal of the pie and use oven gloves! Heat sausage links in the microwave for 2 minutes uncovered or in the oven as directed. Whisk eggs, egg whites, milk, melted butter, and a hint of salt and pepper in a large mixing bowl. Stir in the bits of sausage. Line the bottom of the crust with the potato/onion/herb mixture, layer with a handful of spinach, and pour over the egg mixture. Cover the crust edges with tinfoil to reduce cracking of the piecrust. Cover and refrigerate up to two days and/or bake in the center of the oven for 25-30 minutes.